Never before in the history of mathematics has there been an individual theorem whose proof has required 10,000 journal pages of closely reasoned argument. Who could read such a proof, let alone communicate it to others? 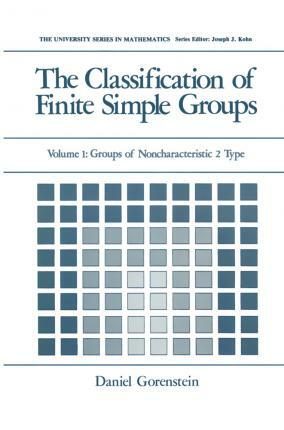 But the classification of all finite simple groups is such a theorem-its complete proof, developed over a 30-year period by about 100 group theorists, is the union of some 500 journal articles covering approximately 10,000 printed pages. How then is one who has lived through it all to convey the richness and variety of this monumental achievement? Yet such an attempt must be made, for without the existence of a coherent exposition of the total proof, there is a very real danger that it will gradually become lost to the living world of mathematics, buried within the dusty pages of forgotten journals. For it is almost impossible for the uninitiated to find the way through the tangled proof without an experienced guide; even the 500 papers themselves require careful selection from among some 2,000 articles on simple group theory, which together include often attractive byways, but which serve only to delay the journey. Illustrations note X, 487 p.